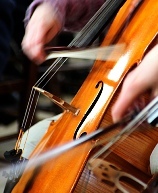 The orchestra runs a very successful Friends and Sponsors scheme, which not only helps to secure the financial status of the orchestra but enables supporters to get to know the orchestra better. There are two schemes. Further details can be obtained by telephone 01252 793830 or from the information desk at concerts. Aimed at friends and companies, this scheme enables any member of the Orchestra - principal trumpet, second violin third desk etc - to be sponsored for a year. We do not pay fees to players but we do attempt to cover their expenses for rehearsals and concerts. For a donation of £100, all expenses for one player will be covered for a concert season. Benefits include those listed for Friends, together with acknowledgement in concert programmes and advertising space for companies for one year. - will help our finances. Please publicise our concerts whenever possible.